Hello! I’m today’s stop on the Florabunda! 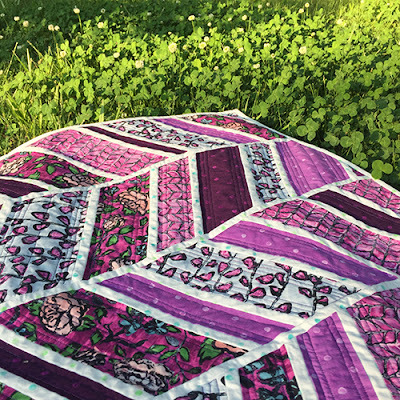 Blog Hop to celebrate Melanie Testa’s new fabric line for RJR Fabrics. If you are just joining the hop, make sure to go back and check out the other posts (see the list of participating hoppers below) so you won’t miss anything. My first impression of Florabunda was that it looks hand printed and hand crafted, and I absolutely adore that look. You don’t see fabrics with that kind of vibe come around very often, at least not in quilt shops and fabric stores. 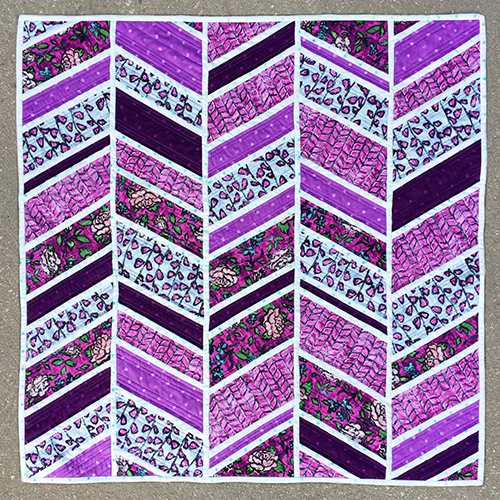 These fabrics are rich in detail, and the colors are saturated and vibrant. This is a fabric collection happy and full of life. It makes for a very joyful baby quilt! 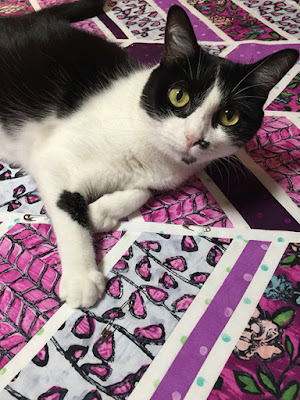 To complement Melanie’s Florabunda fabrics and give them a little breathing room in my baby quilt, I chose polka dot fabrics with white backgrounds from the “Darling Dots” line by Flaurie & Finch for RJR Fabrics. I also used other purple dot fabrics from the same line. 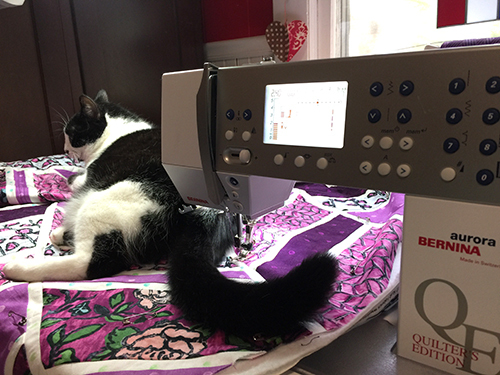 My cat Wicked is always trying to slow me down when I quilt! I had to stop here to avoid sewing over her tail. But it’s hard to stay mad at her when she looks this beautiful; the color of these Florabunda! fabrics really complement her green eyes, don’t you think? Absolutely beautiful! And I'm just itching to be able to get ahold of those fabrics! Thanks for sharing your fabulous quilt design. The photo of Wicked brought tears to my eyes as she looks so like my previous cat Houdini. He was also a studio assistant but preferred to lie overtop of the sewing machine and to dangle his paws down to "assist".